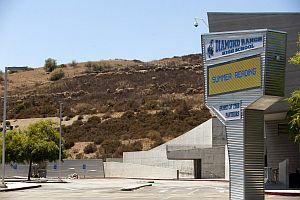 In order to satisfy a state requirement, the city of Diamond Bar is attempting to rezone 30 acres of rolling hills adjacent to Diamond Ranch High School for high-density, low-income housing. The city will choose between two possible 30-acre sites, one on the west side of the high school closer to Diamond Bar’s Pantera Park neighborhood, and the other on the southeast side of the school bounded by Chino Hills Parkway and Scenic Ridge Drive that is closer to Pomona residents, including the 243-unit Hidden Valley Townhome development in Phillips Ranch. Both sites have generated strong opposition from Hidden Valley residents, who say Diamond Bar is shifting the impact of affordable housing onto its neighbors in Pomona, Chino and Chino Hills. “They are putting it as far away from their city as they can,” asserted Debbie Newton, who with her husband Jerry, have gathered 156 signatures against the affordable housing rezoning. The city is drafting an environmental impact report on the zone change. All comments, petitions and emails must be received at City Hall by 5 p.m. Tuesday. The City Council will award a contract Tuesday night to J.H. Douglas & Associates to complete a housing element update, including the change. Read more in Steve Scauzillo’s story AFFORDABLE.